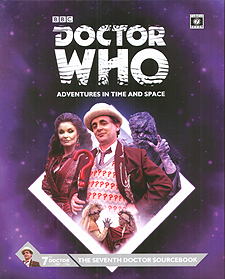 Celebrating the 50th anniversary of Doctor Who, this Sourcebook explores the Seventh Doctor's adventures on Earth and beyond. With detailed information on all the allies, enemies, aliens and gadgets that he encounters, as well as examining each of his adventures, the book contains a wealth of material for the Doctor Who: Adventures in Time and Space RPG. and is also a fact-packed resource for fans of the show! Having survived an attempt on his life from his own future self, it is the Rani who forces the Doctor to regenerate once more, into an incarnation that is every bit as sharp, cunning and eccentric as his predecessors. Battle dragons, psychic clowns and out-of-control robots, match wits with the Rani, the Master and Fenric, and destroy Skaro, the home of the Daleks!